Some adware applications may be very far from being dangerous computer infections, but they are often related to specific programs that pose specific security threats. Ad Blaster is one such application you should be wary of. It is an adware program that is entirely free to use, but users are advised against having Ad Blaster on their computers. If you happen to have installed this adware application on your system, you should remove it immediately. It would also be a good idea to scan your computer for other potentially unwanted applications. According to our research, this program has been published by Surf Island Solutions, and its homepage is located at adblasterapp.com. The website looks informative and reliable. 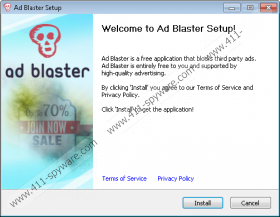 It is also possible to download Ad Blaster directly, which is not a common feature among adware applications. Nevertheless, despite the presence of a direct download link, we cannot rule out the possibility that Ad Blaster might also come bundled with freeware and other adware applications. After all, our security researchers have found that Ad Blaster has Meteoroids and Share Anything registry keys. This shows that Ad Blaster is related to a number of potentially unwanted and even dangerous applications. At the official homepage, Ad Blaster is promoted as a useful tool that can block “all pop ups from all websites.” It says that the application can speed up your computer because it blocks tracking cookies and increases your web surfing security. In other words, Ad Blaster does everything to protect you from adware, but the problem is that this application is an adware program itself. This means that while the program may protect you from third-party pop-up advertisements, Ad Blaster tracks your web browsing activity itself, and, eventually, it ends up displaying commercial ads. What is more, during the installation process, you may receive additional offers to install various toolbars and other applications. If you accept the offer, these toolbars could end up modifying your default browser settings. This leads to specific misunderstandings. Users start to think that Ad Blaster is a browser hijacker, while it is very far from it. If you want to avoid additional applications, you simply need to be attentive during freeware installations. Users often forget that they really need to read all the installation steps carefully. If Ad Blaster and other unwanted applications are already on your computer, simply open Control Panel and remove them manually. After manual removal, scan your computer with the SpyHunter free scanner. 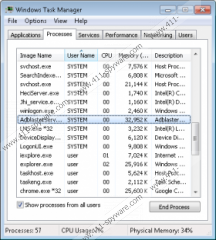 You will need to be sure that there are no other unwanted programs on your PC. Do all you can to protect your system from harm. Click Uninstall a program and remove Ad Blaster. Open Uninstall a program and remove Ad Blaster. Select Add or remove programs and uninstall Ad Blaster.